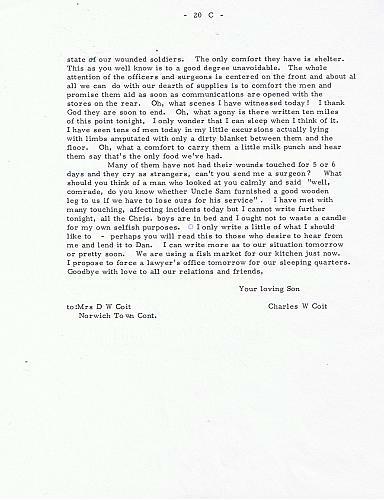 A typed copy of Charles Woolsey Coit's letter from Fredericksburg, Virginia to his parents, Daniel W. and Harriet Coit. Coit was in Virginia in conncection with the Sanitation Commission and not as a soldier. Title by cataloger. Charles W. Coit came to Grand Rapids in 1869 to oversee the property holdings of his father, Daniel W. Coit.